Who Can Stop Ronda Rousey? 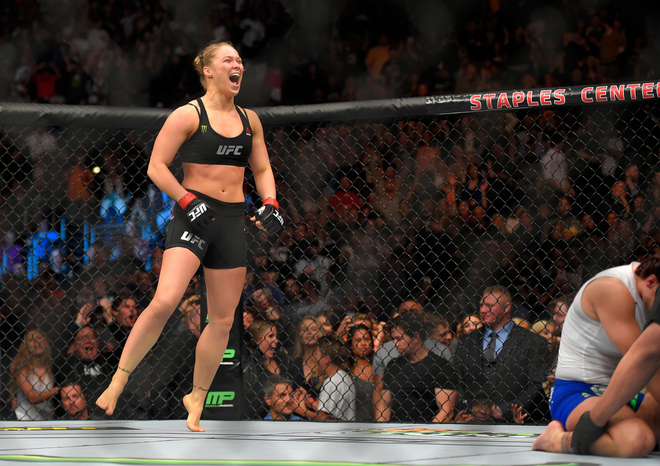 Within 14 seconds, Ronda Rousey had the World talking again. The undefeated Women's Bantamweight Champion took on what was said to be her toughest challenge to date and at the end, extended her untouched record to 11 wins. As 17,654 fight fans packed Los Angeles' Staples Center for the UFC 184 main-event, they were expectant of one of the most dominant female athletes on the planet to be pushed to the limit. In the end, it would be her quickest career victory and a record-breaker too. Then-unbeaten Cat Zingano came out recklessly, an act which made her vulnerable to Rousey's all-too-known submission specialities. Under a quarter-of-a-minute after referee John McCarthy signalled the start of the fight, "Alpha" was tapping at the hands of another patented armbar. A method she expressed rare familiarity with before, but one that demonstrates spectacular transitional grappling nonetheless. The whole technique of facing Cat's legs and applying such pressure on the arm, almost at the means of improvisation, is remarkable. When your last two fights are short enough to fit in an Instagram video—even an animated version as such—it makes noise, and exemplifies the talent on display. When you have someone as dominant, someone who is unblemished in terms of setbacks, and well-proved after 11 fights, some people may have no reason to tune in. For Ronda though, she's set the sport and the Women's division into the sky. Early PPV estimates have suggested contrary to the female fighter struggling to draw. Google searches—a near accurate way of predicting pay-per-view sales—were 4 percent higher than the previous event, UFC 183, which featured the return of the greatest fighter to step foot into the Octagon, Anderson Silva. DirecTV buys were also around that same mark, one thing's for sure though, Rousey definitely broke her own previous margins, per the subscription required F4WOnline.com's Dave Meltzer: "The early numbers were said to be far ahead of any Rousey singularly headlined fight in the past. It’s virtually a lock this will break the all-time record for a show headlined by a woman’s fight that the Rousey vs. Liz Carmouche fight did (450,000 buys), and could double the majority of pre-show estimates." If she has the money attraction—which has seemed to skyrocket after she defeated Davis—then there are little limitations on what she can achieve. But, which challengers will she welcome next to the cage? On Thursday, speaking to the Jay Mohr Sports Radio show Rousey expressed interest to face Correia in Brazil, stacking the deck against her as much as possible. With the Champion wanting so, it would be much obliged for Dana White and the UFC to grant her that fight, because the Rousey-train could be poised to run wild in Brazil. Will Ronda Rousey retire undefeated? Now, it wouldn't be your usual Rousey article if the name "Cyborg" wasn't thrown in there. A night before the sovereign of the UFC Women's division enjoyed her victory the Brazilian, returning after a lengthy spell off, finished Charmaine Tweet in under a minute at the Invicta FC 11 main event. Cris Justino, 13-0 since she lost her debut fight, has been one-half of the dream fight fans are fantasizing about. Most of the UFC 184 post-conference talk around Rousey contained the Cyborg reference. UFC president Dana White was adamant in reiterating that Cyborg's weight was an issue, urging the Featherweight to prove she can make it before getting in there with Rousey. Just like Ali needed Frazier, maybe just like Mayweather needing Pacquiao, Rousey needs Cyborg to cement her legacy and put away all doubts. A super fight would not only be a further boost for the rapid growth of women's MMA but it would put Rousey against what everyone thinks will be her greatest challenge—that's what we all said with Zingano too. Another name big contender for Rousey is Gina Carano. However, a major spanner in the works mid-last-year and the talk of that has quickly deteriorated. For now, with neither fight really on the horizon, can Rousey wipe out the whole division? It's looking so. All in all, there's still plenty left for the Women's Bantamweight Champion of the World to do and achieve. It becomes a question of how big she can get and who will test her, because she has shaken off those tests at ease so far. Speculation will continue. Challengers will come, and they may go. Super-fights will near. But the stable constant? Ronda Rousey. TheSportMatrix • We Live For Sport: Who Can Stop Ronda Rousey? After blitzing past Cat Zingano at UFC 184, we question - can she be stopped?